2015 appeared to be a difficult year for juvenile black bears in some parts of BC, particularly in the Lower Mainland and on Vancouver Island. Concerned about the reports of an abnormally high number of single small bears in poor health and body condition, the BC Wildlife Health Program (WHP) (Ministry of Forests, Lands and Natural Resource Operations) requested to examine as many as possible if euthanized. WHP staff and the BC Animal Health Centre, joint operators of the BC node of the CWHC, received and examined 26 abandoned juvenile black bears during the winter and early spring of 2016. Twenty out of the 26 animals examined were known to have died of traumatic injuries (motor vehicle accidents, gunshot wounds, electrocutions etc. ), but systematic, thorough examinations and further investigations revealed some interesting results. 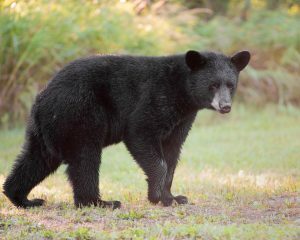 Most of the black bears were undergrown or ‘stunted’, with the cause considered to be most likely due to malnourishment based on microscopic changes in bone (osteopenia, serous atrophy of fat and depletion of hematopoietic stem cells). Age of the bears was estimated by examining the eruption of their canine teeth and considering the time of the year. Estimates ranged from 9 to 13 months. Yearling black bears during this time of year are expected to weigh 30-50 kg; the bears examined weighed between 7 and 22 kg (average 12 kg). Malnutrition leading to stunted growth is likely to delay tooth eruption as well, which made age estimation difficult in some cases. There was significant evidence of infection with an apicomplexan parasite, Sarcocystis spp. in half of the bears examined. Sarcocystis is a large genus, currently comprising approximately 130 recognized species; although the taxonomy is rapidly evolving. Analysis to further characterize the Sarcocystis spp. infecting these bears is ongoing. The clinical signs associated with sarcocystosis (the disease that the parasite can cause) can vary depending on the location of the sarcocysts (cysts within the tissue affected) and the host’s immune reaction to them. The protozoal organisms have been found in muscle, liver, and brain tissue, but these findings are uncommon in healthy black bears. There is no information as yet on the life cycle of this parasite in bears so we do not know where they come from or what makes them more common in some areas or some bears. 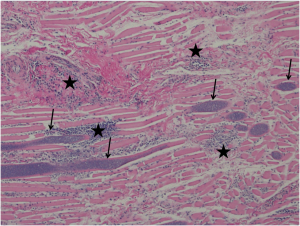 Muscle from the tongue of a yearling black bear with multiple sarcocysts (arrows) within muscle cells associated with marked inflammatory cell infiltrate (stars). In the bears from this survey, sarcocysts were most commonly found within muscle cells (8/17 bears where muscle was examined microscopically). Intramuscular sarcocysts are a common finding in many species, but are typically quite uncommon in bears, affecting less than 2% of bears in the US, although there is some regional variation in prevalence. In addition, the density of the sarcocysts in these bears was much greater than is typically reported and in 50% of the cases appeared to be associated with severe non-suppurative myositis (inflammation of muscle). It is unknown whether or how these intramuscular sarcocysts contributed to the poor condition of these yearlings, but it is possible that there was pain from inflammation in the tongue that could affect feeding, or inflammation of other muscles that could decrease mobility and foraging behaviour. Liver and brain are the other organs commonly reported to be affected by sarcocysts in black bears. 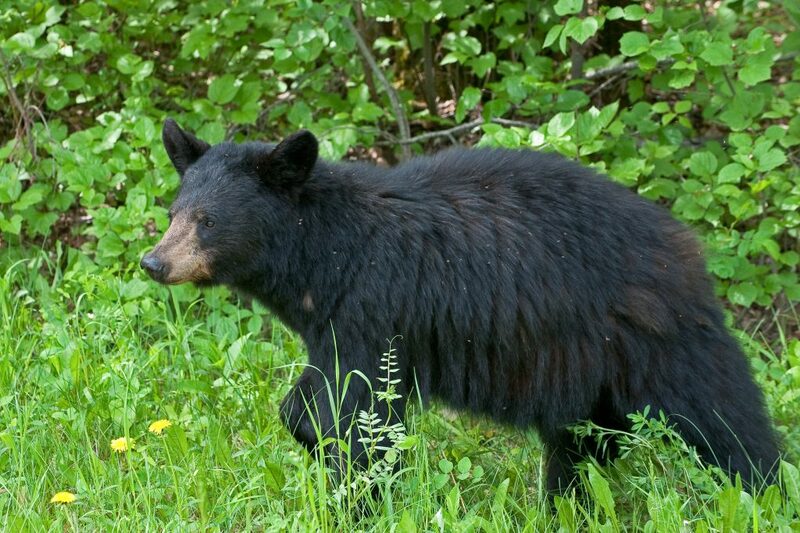 Several cases of clinical sarcocystosis have been previously diagnosed in black bears in BC in both juvenile and aged bears, some showing significant signs of illness attributable to the infection. Hepatitis and encephalitis (inflammation of the liver and brain) associated with Sarcocystis was likely the cause of death in 3/26 of the yearlings examined. Three other bears that died of other causes (euthanized, shot, electrocution or trauma) also had multifocal necrotizing hepatitis associated with Sarcocystis that may have affected their general health and/or predisposed them to trauma, as animals with neurological disease are much more likely to be hit by cars or experience other traumatic injuries. However, sarcocystosis is not confirmed as the single cause of stunting of these yearlings. Malnourishment can be attributed to poor nutrition quality and quantity and for bears there is a strong seasonal variation in food availability. We hypothesize that there was an abundance of food resources in 2013 and 2014, i.e. summer berry crops, which led to a high conception and birth rate in black bear females that in 2015 produced a high number of bear cubs. The late summer of 2015 was very dry and food resources that were relied on at this time of year for pre-hibernation weight gains were low as berry crops dried out. Cub abandonment and density dependent starvation are proposed to have been at least partially responsible for the stunted condition of the bears in this survey. Many were reported to the government because there was no sow seen accompanying the juvenile for weeks and the degree of stunting seen in many cases would have taken many weeks if not months to occur. We believe there was a combination of factors contributing to the small size, poor health and poor body condition of young black bears during this past season and will continue to examine animals to rule out other health issues including Sarcocystis.